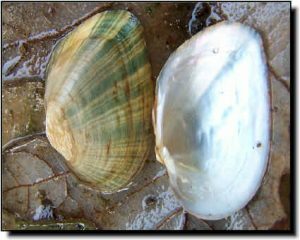 This species is widespread in the eastern U.S. and distributed from Lake Huron, St. Clair and Erie, and upper Mississippi River system, south to Ohio, Cumberland, and Tennessee River systems. In Canada, this species is restricted to the Lake Erie drainage in Ontario. Although intolerant of impoundment, it is considered stable throughout most of its range. Comments: This mussel has a smooth, yellowish shell with the exception of some umbo sculpture consisting of coarse looped ridges. The shell is thin and strong with green rays radiating from the umbo region. It is largely a headwater species, being best-adapted to small streams. Its habitat consists of gravel substrates in cool, spring-fed streams. Weathered shells of this species have been found in Marais des Cygnes tributaries. 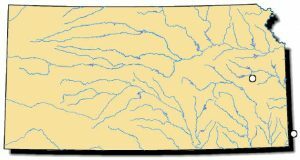 This species is also present within the Spring River basin of Missouri and could be found near the Kansas-Missouri border in Cherokee County.